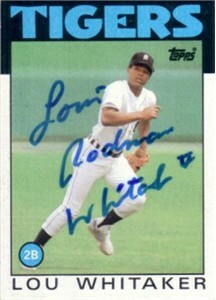 1986 Topps card autographed with his full name by former Detroit Tigers All-Star second baseman Lou Whitaker. Has minor corner wear. ONLY ONE AVAILABLE FOR SALE. With certificate of authenticity from AutographsForSale.com.